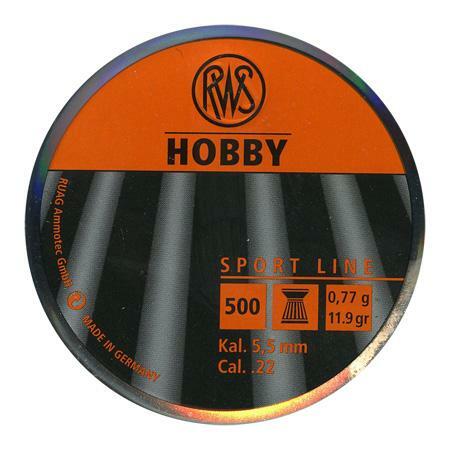 Hobby Flat Pellets. The balanced and reliable quality at a low price makes the ribbed RWS Hobby highly attractive for hobby shooters. Can never go wrong with these. Great calibre pellet to start of with before trying other brands and RWS are well known and trusted. good value and good for practice. My usual brand great consistency. Ive used these pellets many times before and found them to be excellent for target pistol shooting especially concidering the price. Have switched to using these pellets in my CP1 pistol and AA S200 10m target rifle. Rifle 5 shot grouping at 10m is smaller than 5 pence pistol not so tight but always in black on ISSF 10m pistol target..probably more to do with me as shooter than pellets being less accurate.Happy to recommend these pellets doubt using R10 pellets in my airguns would result in much better accuracy than the Hobbys. Great 177 flat head pellets for co2 pistols and priced very well. Product arrived promptly. Well packaged and on time. Excellent cheap pellet. Suspect 90% of 10m pistol shooters wont see much difference to R10s.